If we were to allow modern men to make their own customs to govern themselves, would this lead to chaos? Suppose that we were to tell the inhabitants of each neighborhood of São Paulo that they are free to express their own customs and organize themselves the way they want. It is not difficult to see that the outcome would be a great tumult. The first thing to note is that we cannot build a fortress with crumbling stones. In an epoch of great moral decadence like ours, when we give people this kind of freedom, the normal outcome is disorder. Is the answer then to imprison them? No, because then we would have tyranny. So, we have either the pretense of a democracy, which is actually ruled by demagogues and thieves or we have the tyranny of a dictator. The real solution is to instill morals in society. Customary law evidently supposes a minimum level of morality to work; it supposes a Christian order. I would not be favorable to a sudden pure and simple application of the system of consuetudinary law in present day Brazil. However, I add this: If the customary functions were given to the authentic social authorities in each area, I believe that this could be a good start to re-establishing a natural order. For, through a sort of innate sense of reality, the authentic social elites are able to aptly resolve the local problems. Instead, the political authority as conceived today, far distant from the actual social life of an area, is artificial and resolves nothing. So, why did all of society in the Middle Ages not fall into disorder? Part of the answer lies in the role of the judge then. The judge did not have the right to make the customs, but rather the obligation to make judgments based on them. The customs were made by society through a period of time. The judge, then, ordered that these customs be codified so that he could make sound judgments. When he did not know about some local custom, he would make inquiries so his judgment would be sound. He did this quite simply by talking to the people. He would speak with the women who were filling their containers with water at the village well; he would go to the inn to drink a glass of wine and converse with some dozen locals who knew the customs and, then, he would judge according to them. He would judge a case brought to him not in a forum, because those small villages did not have forums, but in a sort of public session that looked like a family meeting, resting on his own patriarchal authority. In this sense, the judgments of St. Louis of France seated under the oak of Vincennes in the outskirts of Paris became legendary. He would sit there and hear the cases brought by the people and give them just solutions. Countless judges all over Europe did the same. 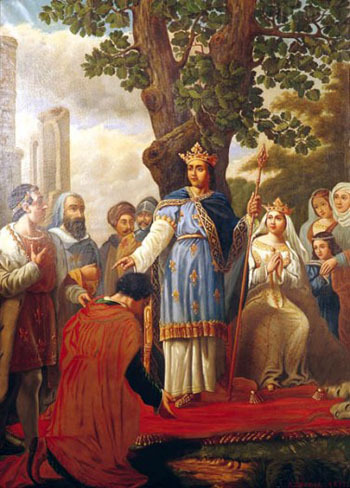 St. Louis IX was the great protector of customs. He not only protected the good customs, but fought strongly against the bad customs in Paris. 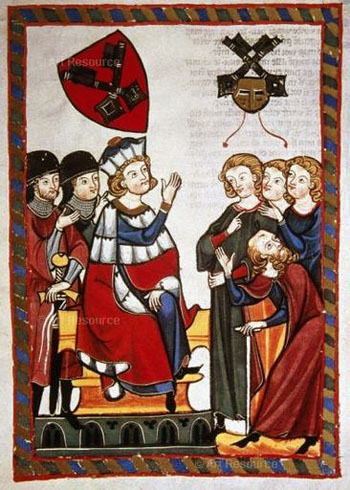 As the king’s role developed in the 13th century, he started to pass the function of keeping good customs and extirpating bad ones to the Parliament of Paris. Customary law governs a wide variety of situations closely linked to concrete daily life. In England some of these customs are still in use today. In France the process was different. It happened that many of the large fiefs had common customs, which constituted the customary law of whole regions like Normandy, Champagne, Auvergne, etc. So, the king formed a system of law for these large regions without violating the consuetudinary rights and local customs of smaller regions. Among the local customs there were still different customs for the various social classes or those in different situations, such as the people who lived in the local forest or around this particular lake or along the banks of that river. Thus you can see the immense diversification of medieval law. What matters did these customs we refer to here touch? They touched on more or less everything. For example, at the top of society, the succession to the crown was regulated by customs, as were marriages among nobles, the homage of the vassal to his suzerain. They were all regulated by particular traditions and customs. Traveling down the social scale, customs dealt with every aspect of life and work: guidelines for the merchants, rules for the guilds, protocols for the policing of the forests and rivers, laws for maritime commerce, procedures to bring cases before tribunals, codes for weights and measurements, which at first were determined by the king but later were regulated by local customs in different ways. Consuetudinary law was established throughout the European territory. Many times these customs gave birth to charters, which were special grants made regarding the customs. In the 10th and 11th centuries these charters were already numerous. The 12th century saw the rise of municipal statutes to rule some cities, all with the consent of the king and feudal lords. Those statutes were simply codifications of the existing local customs. Later, books of customs appeared that were written by jurists who used them to discuss cases and judge them according to the local customs. When these books were well written, their usage became so generalized that they acquired, so to speak, the force of law. 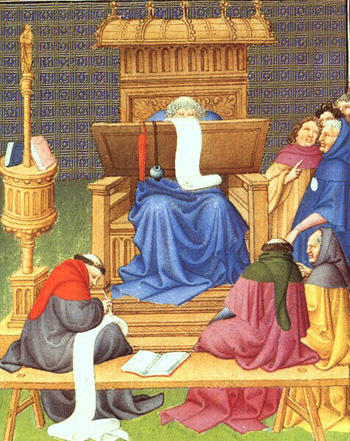 The 12th century also saw compilations of decisions made by judges based on local customs. They constituted a sort of complement to customary law and developed markedly in the 13th century. As this series reaches its end, we have for our perusal an overview on what customary law was, how it was established and how it maintained a strong order. I leave one problem to be resolved later: In this massive bevy of different social bodies and laws, how, in principle, were order and measure established? In this orchestra of thousands of instruments, how was the grand symphony of Christendom played? I leave this question for another time.